The big picture: It appears that graphics cards aren’t the only PC component experiencing a price fall right now. Solid-state drives are also getting cheaper, as manufacturers continue to reduce the price of popular and lesser-known models. Tom’s Hardware notes the OEM Micron 1100 as an example of an SSD with a volatile price, one that seems to rise and fall every day. The publication writes that it found the 2TB version selling for just $200 on several occasions—a result of Micron trying to sell off its 1st-gen 3D flash models to make room for the newer 64-layer memory SSDs. A quick Amazon search showed the 1100 on sale for $280, which is still a good deal for 2TB. 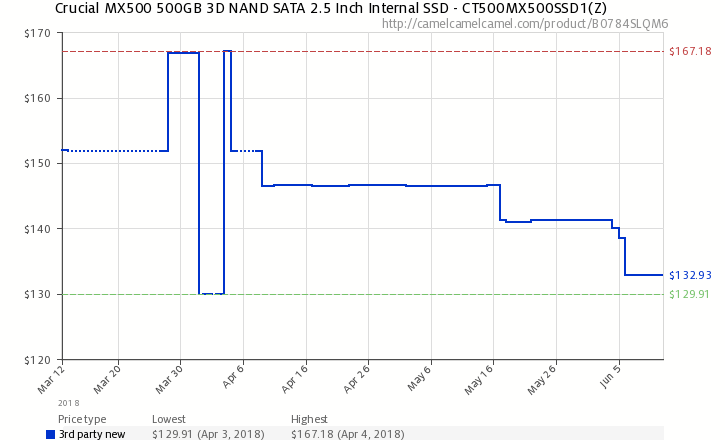 Other, more mainstream SSDs have also seen price decreases. The 500GB versions of the Crucial MX500 and Samsung 860 EVO have fallen sharply over the last six months. The former SSD is now available on Amazon for $110, while Samsung’s model can be bought for just $127. According to DRAMeXchange, one of the main factors behind the falling price of SSDs is an oversupply in the NAND flash market. With the Steam Summer Sale starting next week (June 21), now is probably a good time to buy an SSD for all those new games you won’t get round to playing.